The problem, of course, resides in the European definition of terrorism. The EU definition of terrorism, wittingly or unwittingly, confuses the issue. It needs to be revised. Under the definition of terrorism in American law (18 U.S. Code § 2331), no act can be qualified as terrorist if there is no terror intended. Terrorism is booming in Europe — even though the European Union statistics say it is not. 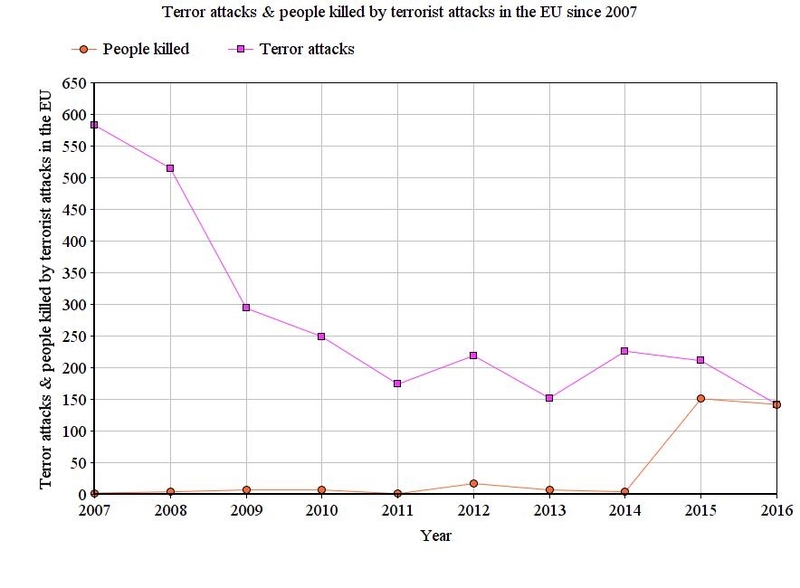 The EU's statistics on terrorism, simply put, confuse the issue. They are a fairy-tale. Since 9/11, in report after report, experts, ministers and public authorities have been saying the same thing: that in Europe (meaning the EU), Islamic terrorism is merely a marginal aberration. Nothing to be afraid of, and if you show too much interest in the matter you are probably on the far-right, aren't you! Do you want to persecute the Muslims and make them the Jews of today's Europe? As experts always do when they want to shut down a debate, they turn to statistics, preferably European statistics. 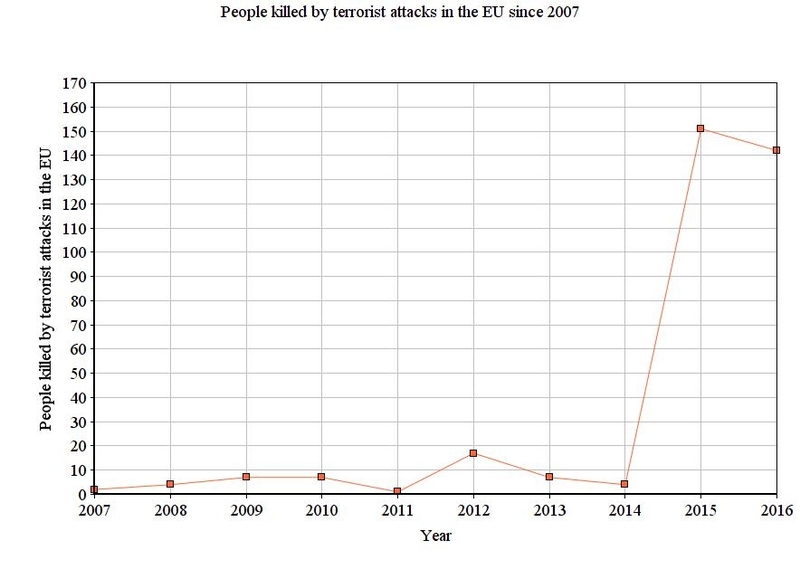 Since July 1, 1999 — the date of its inception — Europol (European Union Agency for Law Enforcement Cooperation) has regularly published an assessment of terrorism in the EU. If you read Europol's last ten EU Terrorism Situation and Trend Reports (TE-SAT), you will find, year after year, the number of "failed, foiled or successfully executed" terror attacks and the subsequent number of victims — all you supposedly need to assess the true nature of terrorism in the EU. 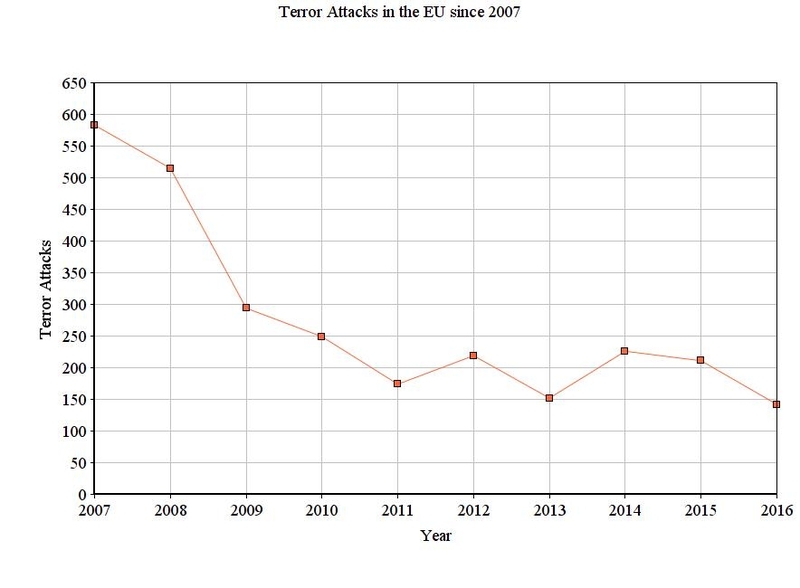 The first surprise is that according to Europol, the trend is clearly downward: far fewer terror attacks in Europe in 2016 than ten years ago! Does that seem a bit counter-intuitive? But, hey, those are the official statistics. This second chart looks much more in line with the feelings of the common man, don't you think? Approximately 150 dead in the EU from terror attacks in 2015 and 2016, compared to zero in 2007, or 4 in 2014. (That is what is so endearing about statistics: you can manipulate many things, such as the psychological and emotional damage or the consequences of a "foiled attack" -- but not the number of dead bodies). If you superimpose the two preceding charts, there is, obviously, zero correlation between the number of attacks and the number of dead. Even if there are fewer attacks, more people are being killed. In 2007, there were 583 attacks but zero people killed. In 2016, there were 142 attacks with 142 killed. seriously destabilising or destroying the fundamental political, constitutional, economic or social structures of a country or an international organisation". On this legal basis, Europol distinguishes between different categories of terror attacks; jihadist terrorism; ethno-nationalist and separatist terrorism; left-wing and anarchist terrorism; right-wing terrorism; and finally, "single issue terrorism" (such as animal rights). There is nothing wrong with these definitions except that one thing has gotten lost: terror. We have known, ever since ancient Rome's system of law, the importance of accurate definitions; and before that, in ancient Greece, of correct hypotheses. If an attack is not intended to terrorize the public, presumably it should not qualify either as terrorism or as a terrorist attack. Here is the EU magic: the second part of EU definition — "unduly compelling a government or international organisation to perform or abstain from performing an act" — whatever act — authorizes one to qualify as "terrorism" countless deeds that are certainly criminal but do not actually terrorize anyone. "In 2011, ETA [Basque separatists] committed one terrorist attack in France (Valliere, Creuse). Two ETA members opened fire against the Gendarmerie while trying to escape from a police checkpoint." "In France, 62 completed attacks and 13 attempted attacks were reported. All these attacks were carried out by Corsican terrorist groups. Their main target, however, remains the tourism sector. Holiday homes and restaurants are often targeted." Corsican nationalists want more autonomy for their island. These "nationalists," however, never kill anyone, and they almost never hurt anyone except themselves; and when they burn a paillote (a small restaurant in the form of a hut on the beach) owned by some Frenchman from the continent, you never know if it is to preserve the beauty of Corsican nature, to take over his business, or because the kitchen was dirty. To qualify all of those acts indiscriminately as terrorism, and to classify them in the same category as the Islamist in Marseille who shouted "Allahu akbar" before slitting the throat of a girl and eviscerating her cousin, is morally repugnant. That atrocity in Marseille received worldwide press coverage and was indeed a terror attack in the purest sense of the word. The increase in the number of dead from terror attacks in 2015-2016 compared to the period 2007-2014 is a staggering 2,291%. The trend appears the same in 2017. The rest is EU sophistry. "The term "domestic terrorism" means activities that— (A) involve acts dangerous to human life that are a violation of the criminal laws of the United States or of any State; (B) appear to be intended— (i) to intimidate or coerce a civilian population; (ii) to influence the policy of a government by intimidation or coercion; or (iii) to affect the conduct of a government by mass destruction, assassination, or kidnapping." Europeans love to fool themselves. The American definition of terrorism is no bargain, either. Children have been charged with "terrorist acts" for drawing pictures. You have to understand that in the US, for example, Hillary Clinton did not have illegal intentions to broker the Uranium One deal to Russia with a cut out via Canada, therefore it was not a criminal act. She was merely duped. Like Mr. Orwell once described, in the future, the meaning of words will be reversed...ie terrorism is not terrorism if terrorism was not intended...you know like "workplace violence". The Left has mastered the technique. It's been how many years since 9/11, and these clowns still haven't defined "terrorism"? This whole false, political designation of "terrorism" and "terrorist" ignores the basics of it all - that such people are criminals who willingly intend and conspire to commit MURDER in order to prove their bona-fides when engaging in EXTORTION against other people! Conspiring to commit murder isn't a "protected political or religious right!" Conspiracy to commit (at least, attempted) murder and extortion are already crimes on the law-books; they don't need special rules with exemptions for "religious" reasons, nor are death-threats to be treated as exempt, "protected holy religious speech rights" either! "Terrorism" is EXTORTION. Supporting, colluding and enabling a crime IS to commit it! That's why gang *membership* IS a crime! Maybe attacks are going down because Islam says "Submit," and Europe has submitted. This is just typical of the EU manipulating the figures of terrorism to suit their agenda of lies and more lies. The sooner this political entity implodes the better. Godefridi gives a frightening true assessment. Nothing can justify terror. 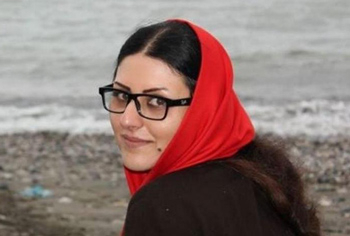 The cultured and progressive world has to consolidate and fight murder by ideology. If not, it means destruction and pain. Maybe the EU's definition of terrorism should be revised to: 'If a criminal act fits our repressive, globalist agenda, it's not terrorism; if it doesn't, it is.' Simple and clear as that. "We have known, ever since ancient Rome's system of law, the importance of accurate definitions; and before that, in ancient Greece, of correct hypotheses. If an attack is not intended to terrorize the public, presumably it should not qualify either as terrorism or as a terrorist attack." Governments are simply doing the same thing with terrorism that they do with statistics concerning inflation, cost-of-living indexes, unemployment, economic growth, crime, etc. They regularly change the basis on which they calculate most of these things, or define them so ambiguously that they can count, or not count, whatever they like, to provide the public with the message they want to be accepted (which may, or may not, have anything to do with the reality of the situation). Government statistics about anything are not to be taken seriously without substantial support from other sources -- they are much more concerned with keeping the public from blaming government for the problems it creates, or demanding action that it has no intention of taking, than providing useful facts. As soon as ISIS is " defeated " in the ME they will focus their attention on Europe, Spain. It was conquered by muslims so it belongs to muslims. In the rest of the EU suicide attacks will be the main problem, nothing can be done about that. The Visigrad countries and Austria will likely be less effected due to their attitude to PC appeasement. For the rest: Good luck and my your god help you, your government is not doing it. Terrorism in Europe. What terrorism? The author is correct that the EU's definition of terror confuses the issue. However, this confusion is general and global. According to Islamic doctrine there is no such thing as terror or Islamic terror the way we understand and define terror. Terror is a tactic so we can use terror, but do not confuse terror and Jihad. Jihad means struggle and not terror. Jihad does not mean holy war. Jihad is a systemic doctrine, it is a complete civilizational war against the infidels. There are different forms of Jihad. Jihad of violence, Jihad of pen and speech, Jihad of money, Jihad of migration/invasion etc. Jihad is what made Islam successful. So, it is not terrorism that is booming in Europe it is Jihadism! By the way, terrorists go to hell, Jihadists go directly to Allah's paradise. Welcome to the 72 most beautiful virgins. Part of the downward trend in terrorism in the EU statistics could also be due to the media, at all levels, including local, getting better and better at not reporting the event that happened in such a way that yup the fact that it was committed by Moslems against those the perpetrator considers kuffir (thus being actually part of the wider phenomenon of islamic terrorism) is not registered in any way. 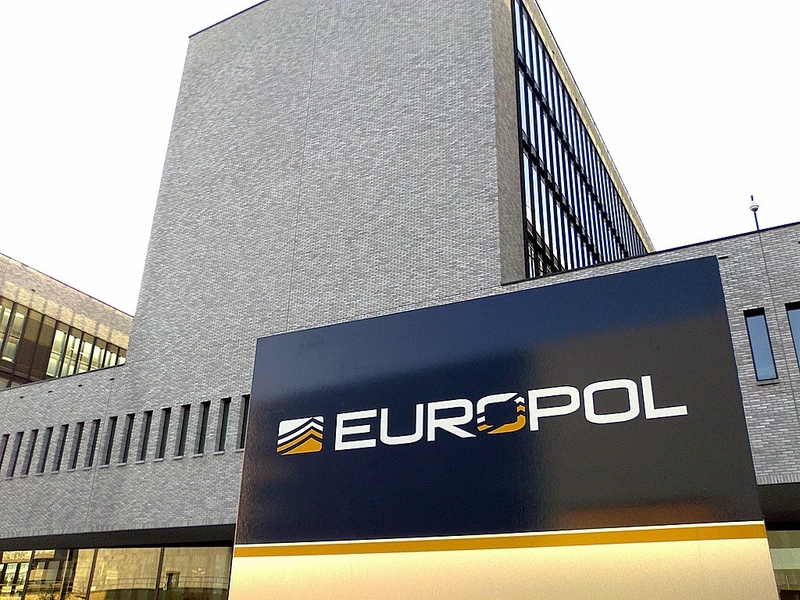 Are not Europol's statistics a joke ? So terrorist acts are going down ? do they also think the numbers of dubious immigrants from the East and South are going down too ? I imagine only Merkel and Macron believe this. The latter was of course designated psychotic by a professional before he was elected. I hope we in the UK get out of the EU on time. They can define it any way they wish, it doesn't make any difference. The truth is that the terrorism is being carried out by Muslims in Europe! Statistics count for nothing because it's real lives ruined, real people, being killed by the Muslim scum. Words mean little to those who have become victims of this religious fanatical cult. In a few years time, they'll come up with another excuse to pardon Muslims. The main aim of these appeasers is to get money by way of investment from Arab states, the fact that they may support Muslim terrorism doesn't matter. After all, it's not their families at risk on the streets of Europe, is it? It's well past the time for these parasitic politicians to be removed and sensible people who care for the people and the Western culture are voted into power. Let's get rid of the dross who are giving our freedoms away for cold hard cash! They don't care how many die to achieve their goal of a multicultural hell on earth! What the EU is really trying to evade is the realty that much of the terrorism is rooted in the Muslim community. How this has been addressed by the last administration in the USA is to characterize any naming of a Muslim by religious identity to terrorist acts is Islamophobic. So that if a man beheads a co-worker and screams alahu akbar while committing the act we are to immediately ignore the religious reference and look for problems in the work place or mental issues. If an Afghanistan man with strong ties to the Islamic community murders nearly 50 gays, the Islamic submissive press corps immediately looks for evidence that somehow Christian values are to blame, and it was not until after Obama left office the FBI released their report the terrorist was inspired by the Islamic State. Even the mention of Islamic State is deferred to ISIS or ISIL which makes it sound more like an Egyptian fertility cult, the Muslim Brotherhood attacks Pharaoh worshipers and would destroy all artifacts of the period possibly even the Pyramids if allowed. The real question must remain why are infidels so useful? Its not simply the terrorist definition that is fudged, it is simply another layer to avoid any criticism of Islam making it even more difficult to determine the effects of Islam on terrorists who define themselves as Muslims committing acts of violence as a form of religious worship and applauded by over 25% of the Islamic community. The definition of terror demonstrates how far liberals will go to ignore reality. The article states, "In short, the EU definition of terrorism, wittingly or unwittingly, confuses the issue." - There is nothing unwitting about it. If you control the language, you control the facts. Again from 1984 - "Don't you see that the whole aim of Newspeak is to narrow the range of thought? In the end we shall make thoughtcrime literally impossible, because there will be no words in which to express it. Every concept that can ever be needed will be expressed by exactly one word, with its meaning rigidly defined and all its subsidiary meanings rubbed out and forgotten."